Did you know that with every new petrol powedred mower purchased from Albany Mowers at a list price of over $499 that you get $230 of FREE workshop service? It is almost too good a deal to be true! A fully assembled, oiled & fuelled, ready to mow lawnmower. Valued at $60. Two years of full maintenance servicing, including two annual services. Valued at $170. 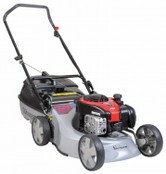 The satisfaction of knowing that you have purchased the right mower to do the job that you want it to do.